Do noise stress impact to addiction? Numerous studies have illustrated the impact of stress on addiction, its development, relapse vulnerability, and the dopamine mechanism. However, various studies on noise exposures as a stressor had been done, which could alter the hypothalamic–pituitary–adrenal (HPA) axis. Noise exposure harmful effect and changes in the individual's health was at least consideration and were less noticed. This review elucidates the facts and consequences of noise exposure toward mesolimbic dopamine circuitry perceptible in addiction. Further, this review generates greater attention and awareness among people toward noise exposure influence on addiction and its relation with dopamine. The noise stress may act as a synergistic influence or augments effect on dopamine level in the synapse of an addicted or initial stage of addicted individual through the corticosterone through HPA axis. The combined effects of multiple stressors (physical, chemical, biological, social and mental etc.) have greater impact than simply the individual stressors. 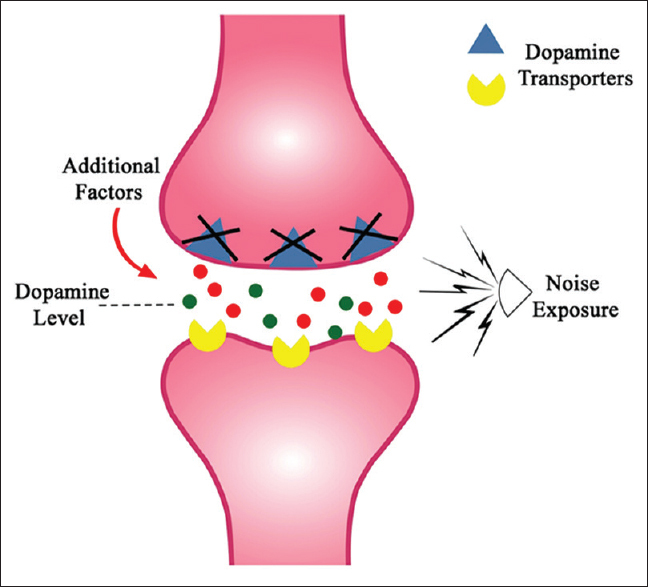 The elevated corticosterone level in noise exposure in turn inhibits the transporter involved in dopamine uptake and further enhance the dopamine level within the synapse of reward circuit may enhance the vulnerability of relapse in addiction. The significance of noise exposure as a stress and other mild stressors influence effect on addiction and psychiatric disorders need to be focused. Strict law-making measures need to be enforced to control and prevent the individual and combined effect of noise stress with other stressors on health. Humans and animals utilize sound as a mean of contact with their environment. Indirectly, sound has enabled the higher beings for their survival in evolution, besides serving a more direct purpose of communication and learning. Sound is a form of energy that is transmitted by pressure variations of which only a hearing apparatus can perceive. The human ear, an advanced hearing apparatus, perceives sound in the range of 20–20,000 Hz. However, when sound exceeds the physiological limits of a hearing apparatus, it becomes noise. Age is a cause for an individual's variability and sensitivity toward sound and frequencies. In addition, sound sources that include traffic, media, industries, loud music, and others have frequencies that tend to exceed the physiological hearing limit (≤90 dB) of the human ear. In spite of environmental noise that stresses the auditory system, it is considered neither hurtful nor noticeable if exposed for a short period of time. According to the National Institute for Occupational Safety and Health, humans are advised to avoid exposure to a noise level above 85 dB (A) for not >8 h. With rapid urbanization and ever-expanding population, exposure to excessive noise is unavoidable. Loud noise has been recognized as an occupational hazard and it not only results in auditory damage but also responsible for neurophysiological and mental side-effects in the longer term. Hence, this review aimed to explore the mechanisms, and in what manner exposure to noise stress may contribute to addiction and its behavior, and how it leads to negative health consequences. The outcome of pressure changes in an air medium is called sound and it is produced by vibration or turbulence. Based on frequency ranges, sound can be classified broadly into three categories: (1) ≤200 Hz as low frequency, (2) 200–2000 Hz as medium frequency, and (3) >2000 Hz as high frequency. Conversely, the term “noise” indicates sound which is unpleasant, unwanted, dissenting, or interferes with the responses of required sound. There are two types of noise: (1) steady or continuous noise, that is, sudden or gradual onset and long, such as sounds from road, rail, air traffic, industries, and construction and (2) impulse or blast noise, that is, sudden onset and in brief pulses that usually exceed an intensity of 140 dB, such as sounds from firing a handgun, detonating a firecracker, and backfiring of a piston engine. The contrary effect of noise exposure on health varies with the organism morphology and physiology which was well defined., Further, it influences the organism vulnerability to harmful effects with other environmental stimuluses. Although many people are aware of possible adverse health effects of noise, these same individuals tend to ignore or even brush off its deleterious effects. Also in the modern life, there are many kinds of jobs and activities where the individuals cannot avoid excess and continuous noise. As a result, they may develop hearing loss, sleep disturbances, heart disease, and endocrine changes, especially of glucose metabolism., The deleterious effect of noise is due to reaction and excitations of the brain and it would occur even during the sleep-awake state. Remarkably during sleep, the auditory system remains alert to ambient noise despite a nonconscious perception of their presence, but this is also the danger part.,, Studies have observed that as compared to an awake state during sleep, there are greater cardiovascular responses to noise exposure and possibly more adverse effects., Furthermore, it is uncertain if the limbic regions are compromised by repeated noise exposure as there may be failure of innate protective mechanism in the middle ear (Rauschecker, 2011). The other potentially more health damaging complications can be a result of synergistic effects of noise with other stressors. Such additional stressors include psychological and unpredictable stress, heat stress, emotional stress, traumatic stress, and physical stress. Studies had already explained the greater and combined effects of multiple stressors other than the effect of individual stressor,, results in chronic sympathetic arousal or states of helplessness. The catecholamines (norepinephrine and epinephrine) from the SAM axis affect both α- and β-adrenergic receptors, but especially the β2-adrenergic receptors. In addition described the alteration in catecholamine levels of discrete brain regions in rat after exposed to noise stress. The ability of the brain to distinguish and categorize different sound levels toward stress may well be explained by adaptive plasticity mediated through the HPA and SAM axis, where the functional and structural alterations were believed to be modulated by local neurotransmitters and endocrine hormones interaction. The acute stress response from noise augments the rate of respiration, heart rate, and blood pressure and a decrease in the gastrointestinal tract activity as part of the “fight or flight” response triggered by glucocorticoids., On the other hand, with chronic stress from continued noise exposure, the persistent activation of the SAM system sensitizes the cortex to the action of corticotropin-releasing hormone and also directly activates the cortex. In addition, chronic stress causes noticeable changes in the sympathetic neural and adrenocortical system associated with behavioral suppression. 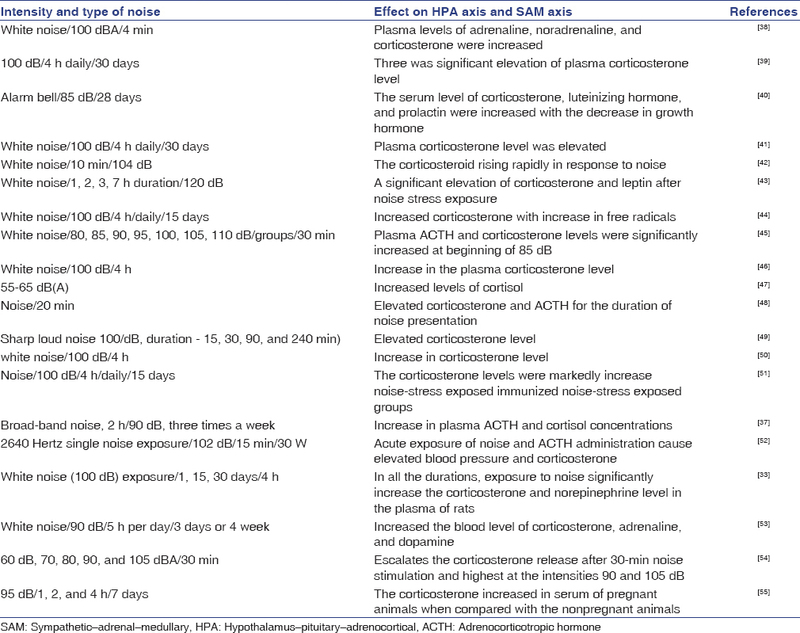 [Table 1] summarizes the various studies in relation to the HPA and SAM axis. Irrespective of numerous studies on noise exposure, its rapid adaptation and acclimatization toward or followed prolonged noise exposure is least convinced. Due to the extensive neural connections between the prefrontal cortex, basal ganglia and limbic systems noise stress may have a wider negative influence on cognition and emotion. 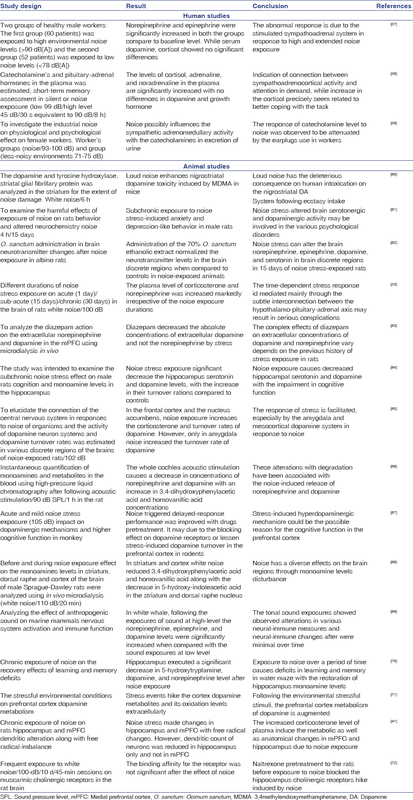 Noise stress reported to cause impairment in cognitive function through dopaminergic mechanism mainly in the prefrontal cortex as evident in different studies [Table 2]. The increased level of catecholamine following or during noise stress can weaken the cognitive function rapidly [Table 2] despite the homeostasis responses at the basal ganglia and amygdala. The prefrontal cortex can alter the reward circuit because of its control over dopamine release. Normally, the prefrontal cortex is resilient enough in maintaining an equilibrium of dopamine levels in the basal ganglia and limbic system. This is achieved by the prefrontal cortex through feedback information received from the limbic system. Noise stress on the amygdala and hippocampus in the limbic system may result in anxiety and emotional stress besides impaired memory and cognitive dysfunction. In individuals with noise addiction, the diminutive control over behavior by the prefrontal cortex becomes weaken with increasing addiction. Subsequently, the basal circuitry of dopamine regulation is further impaired by continuing noise stress exposure by trailing much of the prefrontal cortex inhibitory control on the addiction circuitry and augments it [Figure 2]. The multiphasic behavioral and endocrine changes associated with noise stress has wide individual variations. As a result, the varying dopaminergic, serotonergic, and noradrenergic responses allow the brain to counter and react by neuronal networks reorganization. The differences in individual cognition, attention, and motivated behavior are well correlated with dopamine changes. After chronic noise stress, the dopaminergic and serotonergic pathways are especially involved and often results in behavioral and motivational deficits in animals and human [Table 2]. Furthermore, noise stress can cause excess free radicals production and has the ability to change the brain neurotransmitters, neurochemical environment, neuronal responses, and microcircuitry networks. Stress induced by noise exposure is recognized by the limbic system through its neural connection with the auditory system. 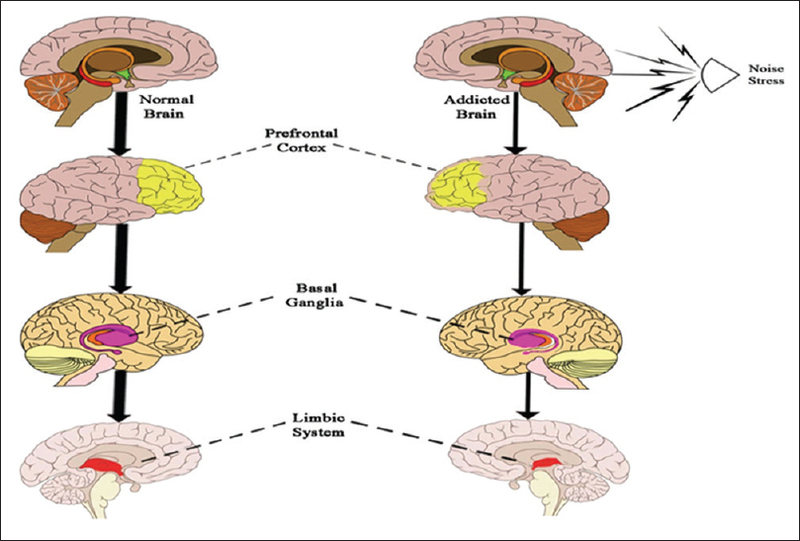 In addition, the adrenocorticotropin hormone and corticotropin-releasing factor (CRF) released from the hypothalamus as a result of noise stress have the ability to stimulate mesocorticolimbic dopaminergic system, and this is the main pathway responsible for addiction and reward circuitry. Dopamine release can be triggered by drugs as well as other stressors through the CRF pathway. In general, in acute stress, the body has the ability to maintain homeostasis through lowering of dopamine and its metabolites. While, in chronic noise stress, the dopamine levels exceed the physiological limit and this predisposes to addiction. Elevated cortisol can upsurge the secretion of dopamine in nucleus accumbens, and in turn, suppression of cortisol reduces the extracellular release of dopamine during response to stress and addictive substances. Hence, the cortisol induced by noise stressor may play a major role in dopamine alteration resulting in addiction and behavior. The differences in gender psychopathic traits personality could be due to alteration in cortisol production and women's whom are psychologically sensitive and also execute similar tendency like men to definite noise. It is also important to correlate traits such as dispositional coping strategies, personality factors and demographic variables (marital status, age, socioeconomic status, gender, and hereditary influences) with the combined effects of noise stress. In a synergistic fashion, noise stress may augment psychostimulants and other physiological behavioral effect on dopamine levels in the synapse. It is likely that there may be other additional factors that will increase the dopamine sensitivity and tolerance toward addiction. The elevated corticosterone levels with noise stress, in turn, inhibit the transporter involved in dopamine uptake,, and further enhance the dopamine levels within the synapse of reward circuit. This may be the reason for vulnerability to relapse with noise addiction [Figure 3]. We conclude that corticosterone increased by noise exposure may contribute to the individual addiction, vulnerability, and relapse. The other stressors in day-to-day life such as psychological, personal, work related, cold, heat, chemical, and social isolation may also have influence in corticosterone, HPA axis. However, the consequence of noise stress on health is unavoidable. The combined effect of various stressors has greater deleterious affect than individual stressors. Further, more research should focus on the consequence of noise stress and other individual stressors persuade on addiction and psychiatric disorders. Strict law-making measures need to be enforced to control and prevent the individual and combined effect of noise stress on health. 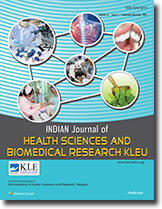 The authors greatly acknowledge Research University Grant from Government Medical College, Shivpuri (MP), India. Jamir L, Nongkynrih B, Gupta SK. Community noise pollution in urban India: Need for public health action. Indian J Community Med 2014;39:8-12. Gourévitch B, Edeline JM, Occelli F, Eggermont JJ. Is the din really harmless? Long-term effects of non-traumatic noise on the adult auditory system. Nat Rev Neurosci 2014;15:483-91. Rosenstock L. Criteria for a recommended standard: Occupational noise exposure. National Institute for Occupational Safety and Health. NIOSH, Publication; June, 1998. p. 98-126. Griefahn B, Scheuch K, Jansen G, Spreng M. Protection goals for residents in the vicinity of civil airports. Noise Health 2004;6:51-62. Suter AH. Noise and its effects. Administrative Conference of the United States; 1991. p. 1-47. Bijsterveld K. Mechanical Sound: Technology, Culture and Public Problems of Noise in the Twentieth Century. Cambridge, MA: MIT Press; 2008. Berglund B, Lindvall T, Schwela DH, OMS. Guidelines for community noise. OMS. 1999. Available from: http://whqlibdoc.who.int/hq/1999/a68672.pdf. [Last accessed on 2015 Jul 12]. Kight CR, Swaddle JP. How and why environmental noise impacts animals: An integrative, mechanistic review. Ecol Lett 2011;14:1052-61. Sørensen M, Andersen ZJ, Nordsborg RB, Becker T, Tjønneland A, Overvad K, et al. Long-term exposure to road traffic noise and incident diabetes: A cohort study. Environ Health Perspect 2013;121:217-22. Spreng M, Cotecchia S, Schenk F. A behavioral study of alpha-1b adrenergic receptor knockout mice: Increased reaction to novelty and selectively reduced learning capacities. Neurobiol Learn Mem 2001;75:214-29. Griefahn B, Bröde P, Marks A, Basner M. Autonomic arousals related to traffic noise during sleep. Sleep 2008;31:569-77. Muzet A. Environmental noise, sleep and health. Sleep Med Rev 2007;11:135-42. Waye KP, Clow A, Edwards S, Hucklebridge F, Rylander R. Effects of nighttime low frequency noise on the cortisol response to awakening and subjective sleep quality. Life Sci 2003;72:863-75. Evans GW, Lercher P, Meis M, Ising H, Kofler WW. Community noise exposure and stress in children. J Acoust Soc Am 2001;109:1023-7. Maschke C, Ising H, Arndt D. Nachtlicher verkehrslarm und gesundheit: ergebnisse von labor- und- feldstudien (night-time traffic noise exposure and health: Results from laboratory and field studies). Bundesgesundheitsblatt 1995;38:130-6. Rauschecker JP. An expanded role for the dorsal auditory pathway in sensorimotor control and integration. Hear Res 2011;271:16-25. Rutter M. Protective factors in children's responses to stress and disadvantage. Ann Acad Med Singapore 1979;8:324-38. Stansfeld SA, Matheson MP. Noise pollution: Non-auditory effects on health. Br Med Bull 2003;68:243-57. Maschke C, Rupp T, Hecht K. The influence of stressors on biochemical reactions – A review of present scientific findings with noise. Int J Hyg Environ Health 2000;203:45-53. Ising H, Prasher D. Noise as a stressor and its impact on health. Noise Health 2000;2:5-6. Van Kamp I, Davies H. Environmental noise and mental health: Five year review and future directions. Noise as a public health problem. Proceedings of 9th Congress of the International Commission on the Biological Effects of Noise (ICBEN); 2008. p. 295-301. Turner JG, Hughes LF, Caspary DM. Affects of aging on receptive fields in rat primary auditory cortex layer V neurons. J Neurophysiol 2005;94:2738-47. McEwen BS. Physiology and neurobiology of stress and adaptation: Central role of the brain. Physiol Rev 2007;87:873-904. Shadlen MN, Newsome WT. Noise, neural codes and cortical organization. Curr Opin Neurobiol 1994;4:569-79. Gray JD, Rubin TG, Hunter RG, McEwen BS. Hippocampal gene expression changes underlying stress sensitization and recovery. Mol Psychiatry 2014;19:1171-8. Murphy E, King EA. Strategic environmental noise mapping: Methodological issues concerning the implementation of the EU environmental noise directive and their policy implications. Environ Int 2010;36:290-8. Babisch W. Stress hormones in the research on cardiovascular effects of noise. Noise Health 2003;5:1-11.
de Kloet ER, Karst H, Joëls M. Corticosteroid hormones in the central stress response: Quick-and-slow. Front Neuroendocrinol 2008;29:268-72. Eraslan E, Akyazi İ, Ergül-Ekiz E, Matur E. Noise stress-induced changes in mRNA levels of corticotropin-releasing hormone family molecules and glucocorticoid receptors in the rat brain. Folia Biol (Praha) 2015;61:66-73. Myers B, Greenwood-Van Meerveld B. Differential involvement of amygdala corticosteroid receptors in visceral hyperalgesia following acute or repeated stress. Am J Physiol Gastrointest Liver Physiol 2012;302:G260-6. Wong DL, Tank AW. Stress-induced catecholaminergic function: Transcriptional and post-transcriptional control. Stress 2007;10:121-30. Samson J, Sheela Devi R, Ravindran R, Senthilvelan M. Biogenic amine changes in brain regions and attenuating action of Ocimum sanctumin noise exposure. Pharmacol Biochem Behav 2006;83:67-75. Aich P, Jalal S, Czuba C, Schatte G, Herzog K, Olson DJ, et al. Comparative approaches to the investigation of responses to stress and viral infection in cattle. OMICS 2007;11:413-34. Sapolsky RM, Romero LM, Munck AU. How do glucocorticoids influence stress responses? Integrating permissive, suppressive, stimulatory, and preparative actions. Endocr Rev 2000;21:55-89. Otten W, Kanitz E, Puppe B, Tuchscherer M, Brüssow K, Nürnberg G, et al. Acute and long term effects of chronic intermittent noise stress on hypothalamic-pituitary-adrenocortical and sympatho-adrenomedullary axis in pigs. Animal Sci 2004;78: 271-283. De Boer SF, Koopmans SJ, Slangen JL, Van der Gugten J. Plasma catecholamine, corticosterone and glucose responses to repeated stress in rats: Effect of interstressor interval length. Physiol Behav 1990;47:1117-24. Sembulingam K, Sembulingam P, Namasivayam A. Effect of Ocimum sanctum linn on noise induced changes in plasma corticosterone level. Indian J Physiol Pharmacol 1997;41:139-43. Armario A, Marti J, Gil M. The serum glucose response to acute stress is sensitive to the intensity of the stressor and to habituation. Psychoneuroendocrinology 1990;15:341-7. Manikandan S, Padma MK, Srikumar R, Jeya Parthasarathy N, Muthuvel A, Sheela Devi R, et al. Effects of chronic noise stress on spatial memory of rats in relation to neuronal dendritic alteration and free radical-imbalance in hippocampus and medial prefrontal cortex. Neurosci Lett 2006;399:17-22. Atkinson HC, Wood SA, Kershaw YM, Bate E, Lightman SL. Diurnal variation in the responsiveness of the hypothalamic-pituitary-adrenal axis of the male rat to noise stress. J Neuroendocrinol 2006;18:526-33. Chandralekha G, Jeganathan R, Viswanathan, Charan JC. Serum leptin and corticosterone levels after exposure to noise stress in rats. Malays J Med Sci 2005;12:51-6. Srikumar R, Parthasarathy NJ, Manikandan S, Narayanan GS, Sheeladevi R. Effect of triphala on oxidative stress and on cell-mediated immune response against noise stress in rats. Mol Cell Biochem 2006;283:67-74. Burow A, Day HE, Campeau S. A detailed characterization of loud noise stress: Intensity analysis of hypothalamo-pituitary-adrenocortical axis and brain activation. Brain Res 2005;1062:63-73. Archana R, Namasivayam A. The effect of acute noise stress on neutrophil functions. Indian J Physiol Pharmacol 1999;43:491-5. Maschke C, Ising H, Arndt D. Nocturnal traffic noise and health: Results from laboratory and field studies. Federal Health Gazette 1995b; 4:130-7. Britton KT, Segal DS, Kuczenski R, Hauger R. Dissociation between in vivo hippocampal norepinephrine response and behavioral/neuroendocrine responses to noise stress in rats. Brain Res 1992;574:125-30. Mennini T, Taddei C, Codegoni A, Gobbi M, Garattini S. Acute noise stress reduces [3H] 5-hydroxytryptamine uptake in rat brain synaptosomes: Protective effects of buspirone and tianeptine. Eur J Pharmacol 1993;241:255-60. Archana R, Namasivayam A. Effect of ocimum sanctum on noise induced changes in neutrophil functions. J Ethnopharmacol 2000;73:81-5. Srikumar R, Jeya Parthasarathy N, Sheela Devi R. Immunomodulatory activity of triphala on neutrophil functions. Biol Pharm Bull 2005;28:1398-403. Gamallo A, Alario P, Gonzalez-Abad MJ, Villanua MA. Acute noise stress, ACTH administration, and blood pressure alteration. Physiol Behav 1992;51:1201-5. Zheng KC, Ariizumi M. Modulations of immune functions and oxidative status induced by noise stress. J Occup Health 2007;49:32-8. Campeau S, Watson SJ. 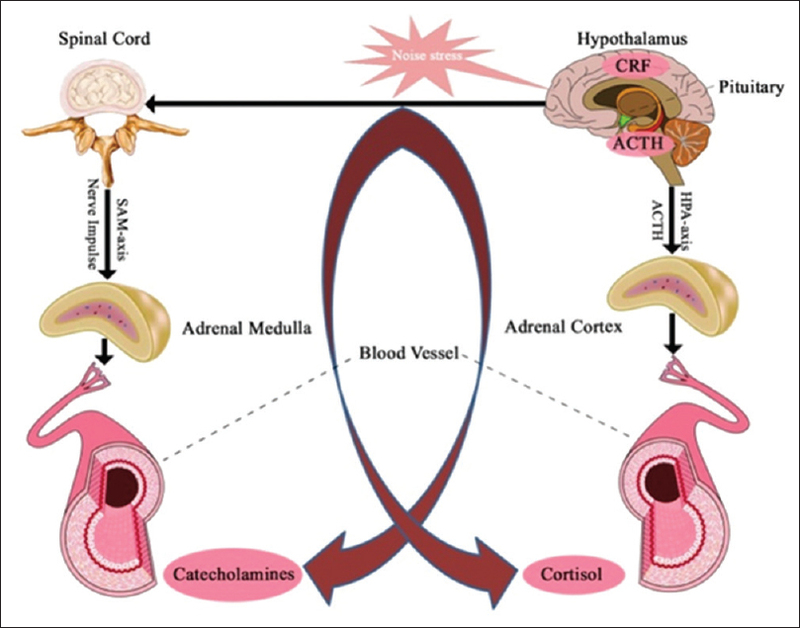 Neuroendocrine and behavioral responses and brain pattern of c-fos induction associated with audiogenic stress. J Neuroendocrinol 1997;9:577-88. Barzegar M, Sajjadi FS, Talaei SA, Hamidi G, Salami M. Prenatal exposure to noise stress: Anxiety, impaired spatial memory, and deteriorated hippocampal plasticity in postnatal life. Hippocampus 2015;25:187-96. Vallet M, Gagneux JM, Blanchet V, Favre B, Labiale G. Long term sleep disturbance due to traffic noise. J Sound Vib 1983;90:173-91. Cavatorta A, Falzoi M, Romanelli A, Cigala F, Riccò M, Bruschi G, et al. Adrenal response in the pathogenesis of arterial hypertension in workers exposed to high noise levels. J Hypertens Suppl 1987;5:S463-6. Brandenberger G, Follenius M, Wittersheim G, Salame P. Plasma catecholamines and pituitary adrenal hormones related to mental task demand under quiet and noise conditions. Biol Psychol 1980;10:239-52. Sudo A, Nguyen AL, Jonai H, Matsuda S, Villanueva MB, Sotoyama M, et al. Effects of earplugs on catecholamine and cortisol excretion in noise-exposed textile workers. Ind Health 1996;34:279-86. Gesi M, Ferrucci M, Giusiani M, Lenzi P, Lazzeri G, Alessandrì MG, et al. Loud noise enhances nigrostriatal dopamine toxicity induced by MDMA in mice. Microsc Res Tech 2004;64:297-303. Naqvi F, Haider S, Batool Z, Perveen T, Haleem DJ. Sub-chronic exposure to noise affects locomotor activity and produces anxiogenic and depressive like behavior in rats. Pharmacol Rep 2012;64:64-9. Ravindran R, Rathinasamy SD, Samson J, Senthilvelan M. Noise-stress-induced brain neurotransmitter changes and the effect of Ocimum sanctum (Linn) treatment in albino rats. J Pharmacol Sci 2005;98:354-60. Finlay JM, Zigmond MJ, Abercrombie ED. Increased dopamine and norepinephrine release in medial prefrontal cortex induced by acute and chronic stress: Effects of diazepam. Neuroscience 1995;64:619-28. Haider S, Naqvi F, Batool Z, Tabassum S, Perveen T, Saleem S, et al. Decreased hippocampal 5-HT and DA levels following sub-chronic exposure to noise stress: Impairment in both spatial and recognition memory in male rats. Sci Pharm 2012;80:1001-11. Nakamura H, Moroji T, Nohara S, Nakamura H, Okada A. Activation of cerebral dopaminergic systems by noise and whole-body vibration. Environ Res 1992;57:10-8. Vicente-Torres MA, Gil-Loyzaga P, Carricondo F, Bartolomé MV. Simultaneous HPLC quantification of monoamines and metabolites in the blood-free rat cochlea. J Neurosci Methods 2002;119:31-6. Abbate C, Concetto G, Fortunato M, Brecciaroli R, Tringali MA, Beninato G, et al. Influence of environmental factors on the evolution of industrial noise-induced hearing loss. Environ Monit Assess 2005;107:351-61. Tsai MD, Cho YH, Wang H. A 5-GHz low phase noise differential Colpitts CMOS VCO. IEEE Microw Wirel Compon Lett 2005;15:327-9. Romano T, Keogh M, Kelly C, Feng P, Berk L, Schlundt C, et al. Anthropogenic sound and marine mammal health: Measures of the nervous and immune systems before and after intense sound exposure. Canadian J Fish Aquat Sci 2004;61:1124-34. Chengzhi C, Yan T, Xuejun J, Xiang L, Youbin Q, Baijie T, et al. Recovery of chronic noise exposure induced spatial learning and memory deficits in young male sprague-dawley rats. J Occup Health 2011;53:157-63. D'Angio M, Serrano A, Driscoll P, Scatton B. Stressful environmental stimuli increase extracellular DOPAC levels in the prefrontal cortex of hypoemotional (Roman high-avoidance) but not hyperemotional (Roman low-avoidance) rats. An in vivo voltammetric study. Brain Res 1988;451:237-47. Lai H, Carino MA, Horita A, Guy AW. Low-level microwave irradiation and central cholinergic systems. Pharmacol Biochem Behav 1989;33:131-8. Arnsten AF, Raskind MA, Taylor FB, Connor DF. The effects of stress exposure on prefrontal cortex: Translating basic research into successful treatments for post-traumatic stress disorder. Neurobiol Stress 2015;1:89-99. Williams GV, Goldman-Rakic PS. Modulation of memory fields by dopamine D1 receptors in prefrontal cortex. Nature 1995;376:572-5. Kraus KS, Canlon B. Neuronal connectivity and interactions between the auditory and limbic systems. Effects of noise and tinnitus. Hear Res 2012;288:34-46. Irwin MR, Segal DS, Hauger RL, Smith TL. Individual behavioral and neuroendocrine differences in responsiveness to audiogenic stress. Pharmacol Biochem Behav 1989;32:913-7. Fillenz M, Lowry JP. The relation between local cerebral blood flow and extracellular glucose concentration in rat striatum. Exp Physiol 1998;83:233-8. Braver TS, Barch DM. A theory of cognitive control, aging cognition, and neuromodulation. Neurosci Biobehav Rev 2002;26:809-17. Servan-Schreiber D, Bruno RM, Carter CS, Cohen JD. Dopamine and the mechanisms of cognition: Part I. A neural network model predicting dopamine effects on selective attention. Biol Psychiatry 1998;43:713-22. Grace AA, Floresco SB, Goto Y, Lodge DJ. Regulation of firing of dopaminergic neurons and control of goal-directed behaviors. Trends Neurosci 2007;30:220-7. Loganathan, Rathinasamy S. Alteration in memory and electroencephalogram waves with sub-acute noise stress in albino rats and safeguarded by scoparia dulcis. Pharmacogn Mag 2016;12:S7-13. Lavicky J, Dunn AJ. Corticotropin-releasing factor stimulates catecholamine release in hypothalamus and prefrontal cortex in freely moving rats as assessed by microdialysis. J Neurochem 1993;60:602-12. Wand GS, Oswald LM, McCaul ME, Wong DF, Johnson E, Zhou Y, et al. Association of amphetamine-induced striatal dopamine release and cortisol responses to psychological stress. Neuropsychopharmacology 2007;32:2310-20. Tsai CC. Preferences toward Internet-based learning environments: High school students' perspectives for science learning. Educ Technol Soc 2005;8:203-13. Pani L, Porcella A, Gessa GL. The role of stress in the pathophysiology of the dopaminergic system. Mol Psychiatry 2000;5:14-21. Wand G. The influence of stress on the transition from drug use to addiction. Alcohol Res Health 2008;31:119-36. O'Leary MM, Loney BR, Eckel LA. Gender differences in the association between psychopathic personality traits and cortisol response to induced stress. Psychoneuroendocrinology 2007;32:183-91. Widen S, Bohlin M, Johansson I. Gender perspectives in psychometrics related to leisure time noise exposure and use of hearing protection. Noise Health 2011;13:407-14. Gorboulev V, Shatskaya N, Volk C, Koepsell H. Subtype-specific affinity for corticosterone of rat organic cation transporters rOCT1 and rOCT2 depends on three amino acids within the substrate binding region. Mol Pharmacol 2005;67:1612-9. McReynolds JR, Taylor A, Vranjkovic O, Ambrosius T, Derricks O, Nino B, et al. Corticosterone potentiation of cocaine-induced reinstatement of conditioned place preference in mice is mediated by blockade of the organic cation transporter 3. Neuropsychopharmacology 2017;42:757-65.